Running powerful lighting over your little slice of the ocean? Perhaps thousands of gallons per hour in water movement to keep those polyps swaying happily? Maybe a pair of high wattage tank heaters maintaining tropical reef temperatures as well? Have you ever wondered what your tank costs are for electrical consumption? In these days of seemingly ever increasing electrical costs, along with the push to conserve energy, it is important to see where your hard earned dollars are being spent. In this article I will attempt to explain (with some basic calculations) how I determined exactly what my tank draw is and how much it affects my monthly bill within a few cents. One method would be to calculate mathematically using the product of amperage, voltage and the power factor of each piece of equipment. However this would not offer a true picture of usage as these readings are based on the maximum output of any given piece of equipment. Maximum output with a one hundred percent power factor is rarely if ever achieved. Power factor is the ratio of true power or watts to the apparent power or volt-amperes. The power factor is expressed as a decimal or in percentage. Kilowatts indicate real power and Kilovolt-amperes apparent power. They are identical only when current and voltage are in phase i.e., when the power factor is 1.0 or one hundred percent. My calculations will be based upon readings taken in a real time situation of actual draw (amperage) by either individual piece or group of components because ampmeters and voltmeters indicate total effective current and voltage regardless of the power factor. In other words the ampmeter doesn’t care how the component uses the amps, just that it is using X amount of amps to perform the job regardless of efficiency. 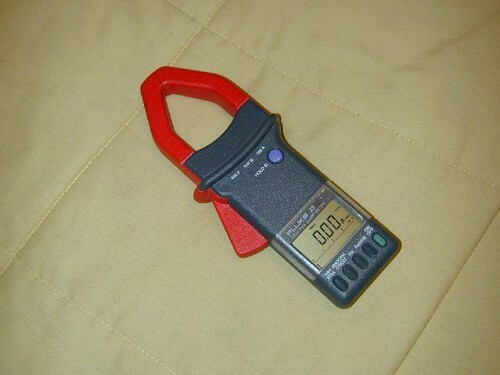 Using the clamp on ampmeter negates the need to know the power factor. It measures what the component uses, not how it is used. The ampmeter will see what your residential electric meter sees. The tank (All-Glass Aquarium) is a 120 gallon reef-ready using a standard 30 gallon tank as a sump. Sump return is handled by a Supreme Mag12 pump which feeds a ¾ inch Sea-Swirl (Aquarium Currents Inc.) Rotating Return Device and the skimmer (Precision Marine Bullet 2) is fed by a Supreme Mag18. Additional water movement is provided by four Aquarium Systems Maxi-Jet 1200 power heads attached to a Red-Sea Fish Pharm Ltd. Wavemaster Pro wave maker, and a GenX Mak4 water pump which is part of a closed loop system. A 300 watt (w) Otto Computherm heater keeps the tank at 82ºF (~28°C). Lighting consists of two 400w 6500k Iwasaki halides powered by a PFO dual ballast, and two 110w VHO (very high output) actinics powered by an Icecap 660 ballast. And finally an Advanced Reef Technologies K2R calcium reactor using an Ehiem model 1046 pump for re-circulation and fed by another Maxi-Jet 1200.
short length (approximately 12 inches) of 12/3 wire to make a “patch-cord”. Everything in this list can be found at a local hardware store, with the exception of electricity rates which can be found on your most recent bill or the electric company’s web site. In order to create the patch-cord you must carefully strip away the outer most insulation from the wire with a sharp instrument, leaving the insulation on the three internal wires (usually white, green, and black) intact. 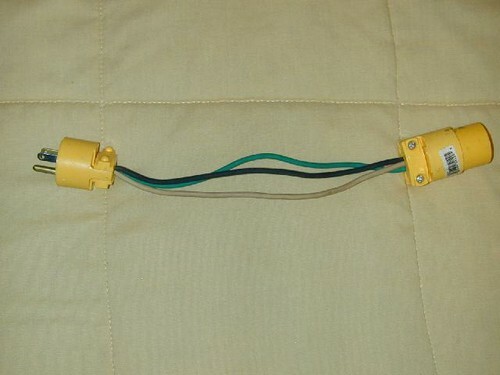 Properly attach the straight blade plug and connector to the wires (white wire to silver connector, black wire to gold connector, and green wire to green connector). This patch-cord will be used in conjunction with the clamp on ampmeter to measure amperage (Figure 1). The meter I used is a Fluke 33 True RMS Clamp Meter (Figure 2). Electric company rates in my area (New York) are determined in two ways. Either a regular rate of $0.1237/kilowatt hour (kwh) (24 hours per day every day), or a day/night rate which runs $0.1391/kwh (Day-time Period 7 a.m. to 11:30 p.m. EST or 8 a.m. to 12:30 p.m. EDT) and $0.0571/kwh (Night-time Period 11:30 p.m. to 7 a.m. EST or 12:30 a.m. to 8 a.m. EDT). With so much electrical equipment on the tank, most people use power strips and I’m no exception. At this point we can measure the power draw (amperage) of each individual piece or the entire power strip worth of equipment. Once the patch-cord is placed between the power strip (or equipment plug) and the wall outlet, simply place the ampmeter around either the white or black lead of the patch-cord. Many digital ampmeters will display to the second or even third decimal place. For our purposes we can round off to the nearest tenth of an amp. I recommend measuring the lighting system separately from the rest of the tank so we can take photoperiod into account, thus giving a more accurate view of total costs involved. My tank is set up so that one circuit handles both halides and the sump return pump, and a second circuit handles the VHO lighting and the rest of the electrical equipment. This way if a circuit breaker should trip, there will be at least some light and water movement available to the tank. The following chart shows the readings taken as indicated. Cost can be determined using these figures. For 10 hours a day total equipment draw is 1.6kw per hour. For the remaining 14 hours (all equipment without lights) the draw is 0.5kw per hour. Now we simply multiply kw by run time hours for kilowatt hours, then multiply by the previously mentioned regular rates. If light timers run 10am to 8pm EST, we can determine if the day/night rates will provide any savings. Based on current timer settings, no savings is realized by taking advantage of the day/night rates offered by the electric company. However, substantial savings would be evident should the lights be run during the discounted nighttime period. Hopefully this article has enlightened you as to where electrical costs are in relation to reef keeping. I wish to thank my friend Richard Boll, Electrical Engineer, for his expert advice. Disclaimer: This article is for informational purposes only. If you are unsure of what you are doing, consult an electrician! This author cannot be held liable for any damage to equipment or bodily injury.